You may have heard of Michele Knotz from a little well-known anime series called “Pokémon.” Now in their 15th season, Michele returned as the voice of Team Rocket’s Jessie and so far picked up a few new Pokémon, Woobat, Swoobat, Minccino, and the female Snivy. Before season 14, Michele voiced May, Nurse Joy, the Pokédex, Piplup, Manaphy, Squirtle, Bulbasaur, Chimecho, Beautifly, Masquerain, Dustox, Cacnea, and many others. 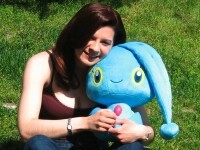 She also voiced Misty for the Pokémon 10th Anniversary Special, “The Mastermind of Mirage Pokémon.” In the Pokémon Special, “Pokémon Mystery Dungeon, Team Go-Getters Out of the Gate” she voiced Chikorita. Other anime roles include Hajime Yagi in “The World of Narue,” Takako Kawashima in “Shootfighter Tekken,” Matsumoto and various additional characters in “To Heart,” Razali, Cindy, Greta, and The Fairy in “The Third,” Ogiue Chika in “Genshiken,” Koyuki Asagiri in “Kujibiki Unbalance,” Chou’un Shiryuu in “Ikki Tousen,” Tomoe and Airi in “Queen’s Blade,” and Potaru Tanaka and Inumi in “Magical Witch Punie-Chan.” As far as video games go, Michele has voiced the Pokémon Trainer, Squirtle and various other Pokémon for the Nintendo Wii’s: “Super Smash Bros. Brawl,” Piplup and many others in “PokéPark Wii – Pikachu’s Great Adventure,” Snivy, Piplup and many others in “PokéPark 2 Wonders Beyond,” and various characters in “Heathcliff the Fast and the Furriest.” But Michele doesn’t just work on anime and video games. She’s also a script adapter for various dubbing projects and lends her voice to many other types of work.